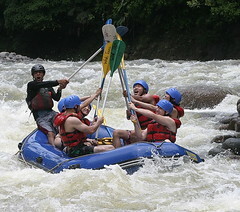 After a busy night out in San Jose sampling the local karaoke bars, the more adventurous of our group roused themselves at the early hour of 6am to spend the day white-water rafting somewhere in the Costa Rican jungle. After a brief breakfast stop en route at a restaurant with the most amazing views we arrived at the river. Our guides proved to be a lively bunch. Kevin, Andres, a rather attractive young man in a kayak and our guide Roberto whose catch phrase proved to be “Come to the back of my boat baby and relax”. They gave us a comprehensive safety talk where we learned the maneuvers needed to have a safe journey and set off. However, after approximately 30 seconds we got stuck on a rock where we got our first chance to practice our bouncey technique (everyone bounces up and down to free the boat). This successfully completed, we continued on for perhaps 2 minutes before we expertly beached ourselves on a rock the size of a … very large rock. We bounced up and down energetically and tried everyone going to the left side, right side, front and back of the raft (baby), then we gave up, leaving Roberto and the kayak man to free it using ropes. Then we jumped back in and had a fairly hectic time steering ourselves through some fierce looking rapids. However, the other boat got stuck soon afterwards so we all had to get out onto the riverside and wait for them to free the raft. Roberto managed a spot of meditation on yet another rock before going on to help the others free their boat. Half an hour later we returned and set off again. Following Roberto’s expert instructions (‘get in and relax baby’), we steered ourselves through some more brilliant water, getting soaked to the skin. During one hectic moment, Jo decided to take a swim but she was quickly hauled aboard by our expert guide Roberto. At around 12 we stopped for lunch at a nice spot on the river. A brief crisis occured when we realized that we had cigarettes aplenty but no lighter and our hero Roberto ran all the way up the hill to buy one. Following the morning’s excitement of the Grade 4 rapids, the calm waters of the afternoon’s stretch of river gave us a welcome chance to tell jokes and admire the lush jungle which rose steeply on each side of the crystal clear water. The clear water was not to last however, when we left the tributary and joined the main river, which was a lovely toffee colour. The water here was fresher and had large waves and deep holes. Kevin steered us backwards into several of these which was fun and also paddled us in circles so we span around really fast on the rapids which was brilliant. Kevin pointed out all the interesting things like the efforts which had been made to shore up the river banks with stones to keep it on course and the area which they are going to dam for a hydro-electric power station. At about 4pm we reached the end of our trip, soaked to the bone, we went to a restaurant and changed into our dry clothes and stopped on the way back for a nice cold beer. Most people slept on the bus on the way back and an early night was had by all. This entry was posted in mobile geo social and tagged costa rica, travel. Bookmark the permalink. This is a retropost, faithfully restored from an ancient 1997 online group travelogue written by a bunch of people on a road trip through Central America. More here. Great review. The picture looks very inviting. The group are really having a great time in feeling the thrill provided by the gushing rapids! Awesome!